Welcome to the last day of our epic baking week! 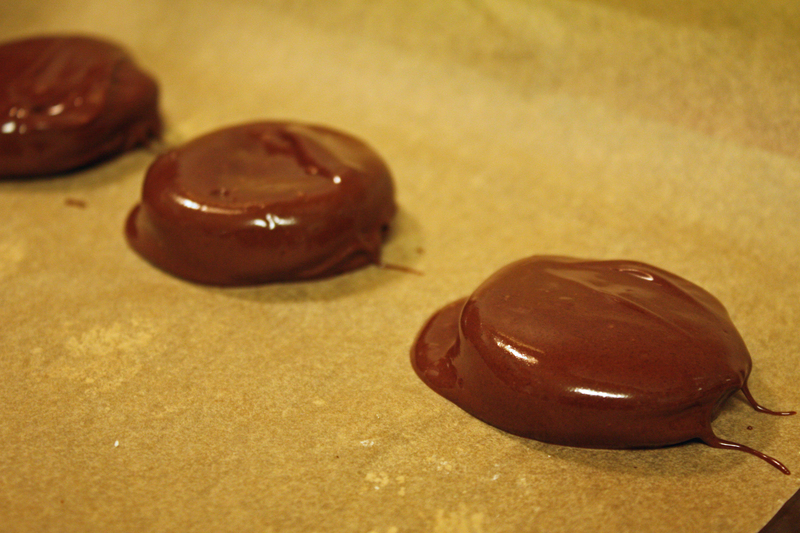 In my most humble opinion, I think we saved the best for last–homemade peppermint patties. When I found this recipe and posted it on one Sunday’s Recipes Around the Web, I just knew I had to add it to my Christmas baking list.The peppermint patties were so easy and fun to make, although I did have to turn a blind eye to the ingredients–6 cups of powdered sugar! You start by forming a dough out of sweetened condensed milk, peppermint extract, and powdered sugar. 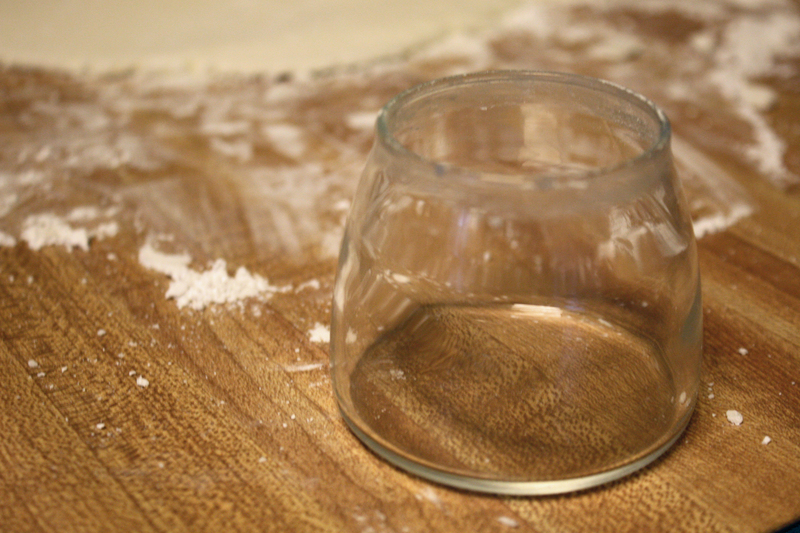 I highly recommend doing this in an electric mixer because the dough gets really stiff. Next, you knead the dough until it becomes even more stiff, snf then roll it out to 1/4 inch thick on a surface coated with powdered sugar. 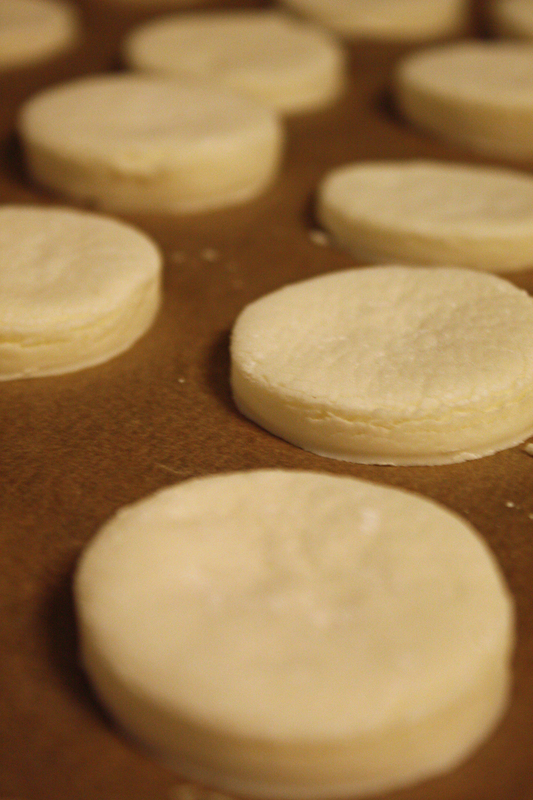 Next, the recipe says to cut the dough into approximately 1 1/4 to 1 1/2 inch circles. I didn’t have a round cookie cutter, so I searched all over the house till I found something that would work–my salad dressing jar! 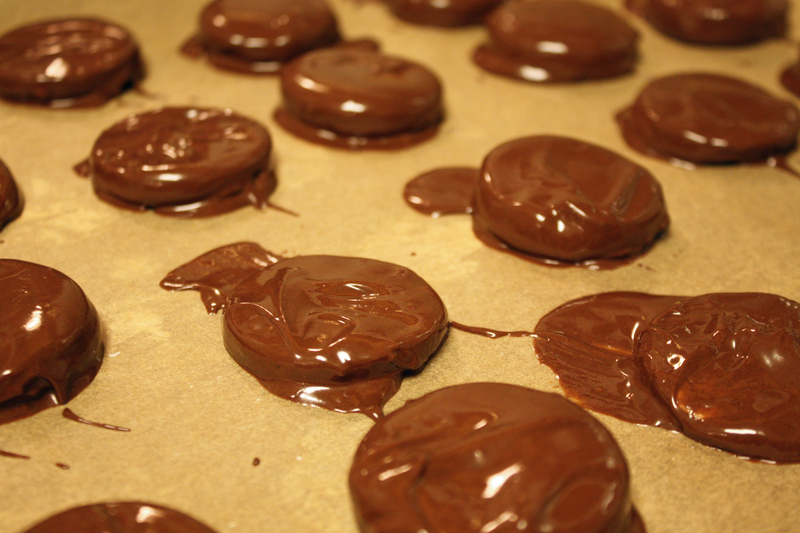 Our circles were more like 1/2 or 3/4 of an inch thick, so we ended up with about 32 peppermint patties. 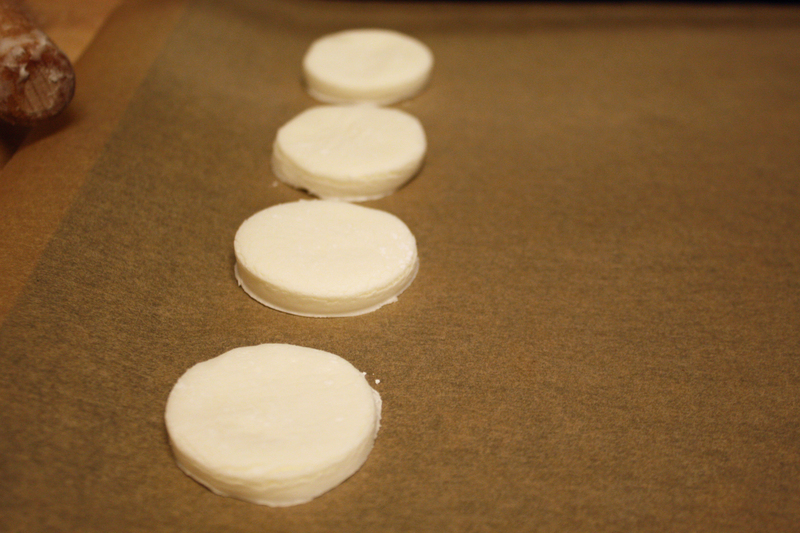 Place the peppermint patties on parchment paper to dry. 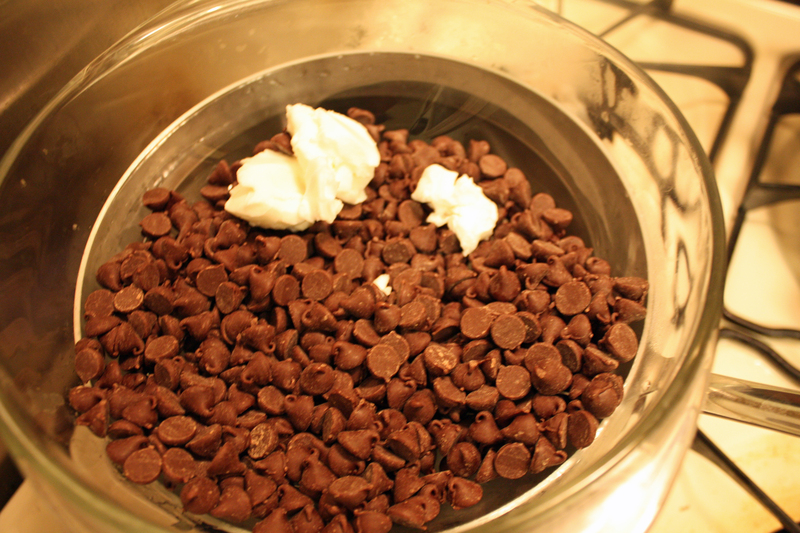 They need to dry for 2 hours on each side in order to set up before you dip them in the chocolate. When the patties are dry, heat the chocolate and shortening in a double boiler on the stove. We just used a large glass boil on top of our sauce pan. 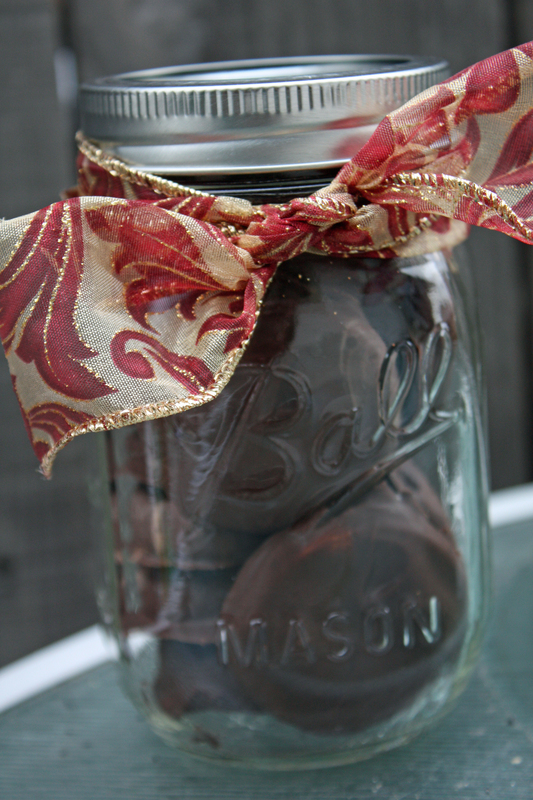 This helps maintain the temperature of the chocolate and prevents it from burning. 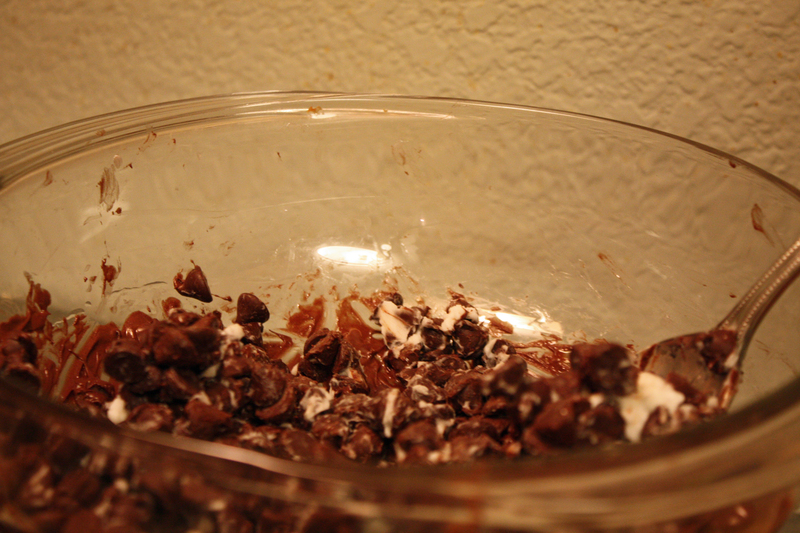 Next, place a few peppermint patties into the chocolate mixture and coat completely with the chocolate. 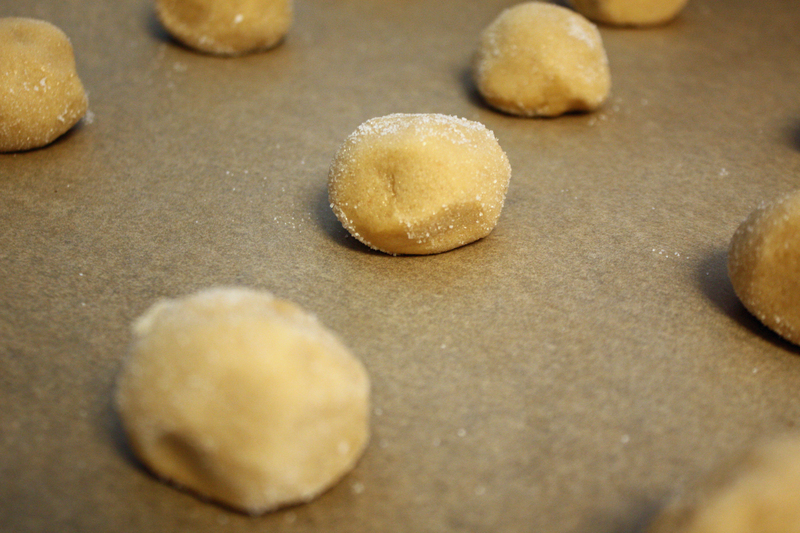 When coated, remove and place on parchment paper. You’ll need to let the chocolate harden for about 12 hours before serving. If you can resist eating them all, the peppermint patties make great gifts–there just might be a few lucky people under my Christmas tree! Combine the sweetened condensed milk and peppermint extract in an electric mixer. Slowly add the powdered sugar and beat. Knead on a surface sprinkled with more sugar until dough is stiff. (The stiffer the better when it come to the dipping part!) 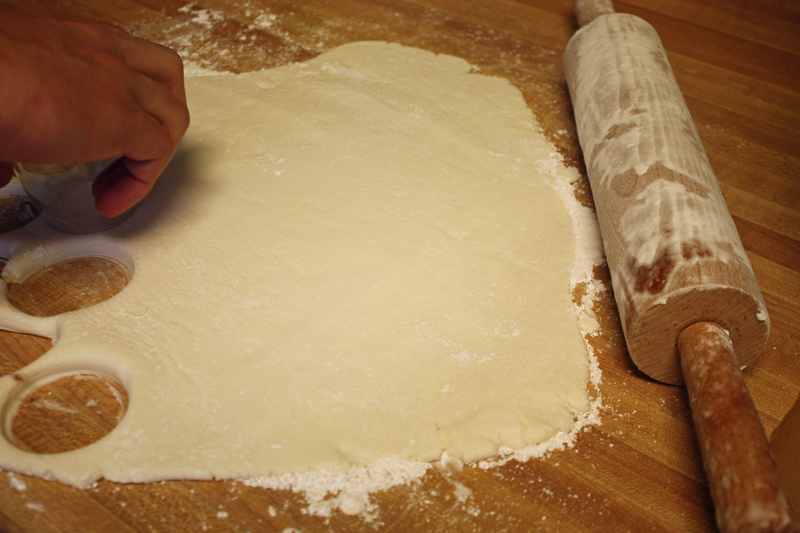 Add more sugar while kneading if the dough is sticky. 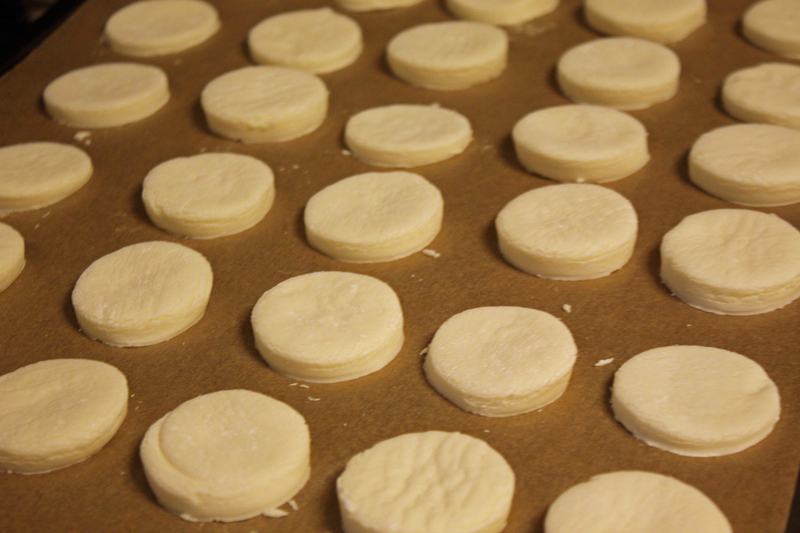 Cut into approximately 1 1/4 to 1 1/2 inch circles. If they are much bigger than that they fall apart when you dip them. Let the cut patties dry for at least 2 hours on *each* side. They need to be really dry. 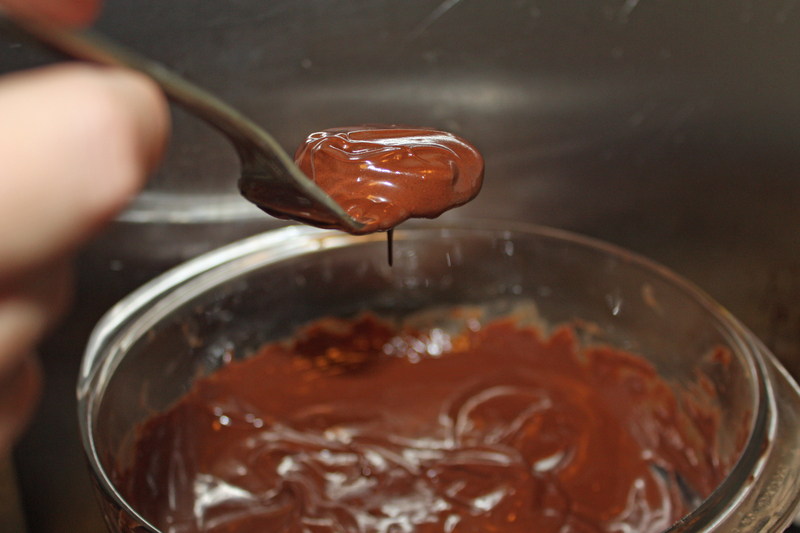 Melt chocolate & shortening it a double boiler; stirring constantly until smooth, using 1 Tbls of shortening for every 6 oz. of chocolate. Keep chocolate hot for dipping. Dip patties in melted chocolate. Remove and place on parchment paper and let harden for about 12 hours. These marshmallows were one of my favorite Christmas goodies we made this year. It was just so fun watch them come to life! 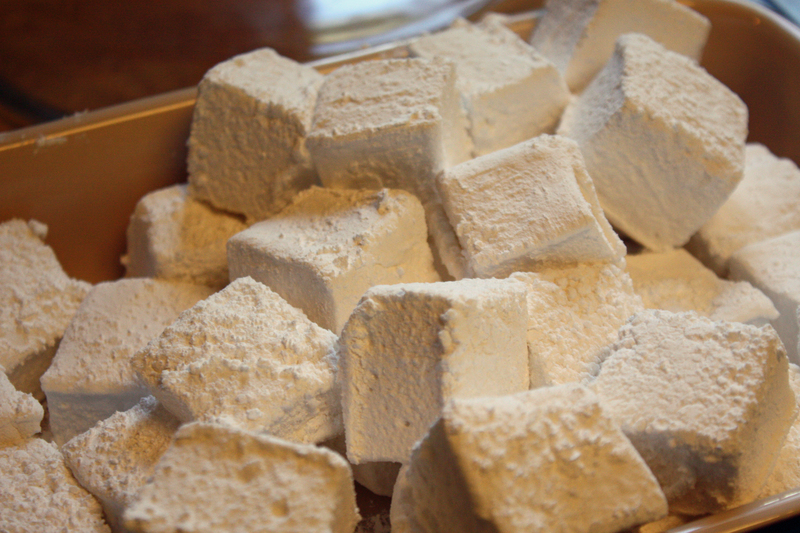 My sister had actually made marshmallows for Christmas a few years ago, and though I’m not usually a huge marshmallow fan, these were so good that I knew I needed to make them soon. So in preparation for this year’s baking, I started doing some research on just exactly how they were made and was pleasantly surprised to find the steps were pretty simple. You have to be a bit careful heating the corn syrup and sugar on stove stove. Jeff wouldn’t even let me touch it because he knows I’m so accident prone! Also, you’ll know this step is done when the mixture starts to clarify. They key to successful handling of what could be a sticky mess is lots and lots of powdered sugar. As you’ll see in the recipe, you need to add it a few times throughout the process and from what I learned, don’t be afraid to add generous amounts. Holiday baking isn’t supposed to be healthy after all! We also dipped a few of the marshmallows in the chocolate we had made for the peppermint patties (so excited to share this with you tomorrow)–pure heavenly goodness! Makes about 24 – 2 1/2 inch (7.5 cm) marshmallows. 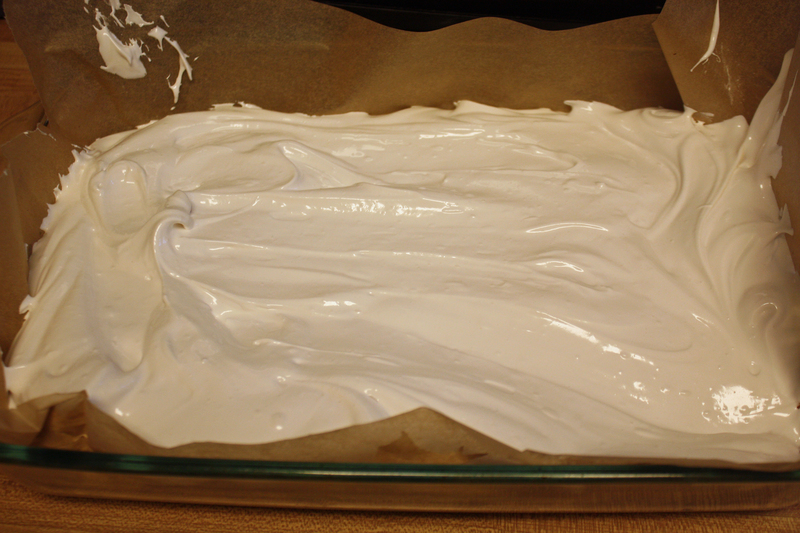 Lightly butter, or spray with a non stick vegetable spray, the bottom of a 13x9x2-inch (33x23x5-cm) baking pan. Line the bottom of the pan with parchment paper. Then sift about 3 tablespoons of confectioners’ (powdered or icing) sugar onto the bottom of the pan (this will help release the set marshmallow from the paper). 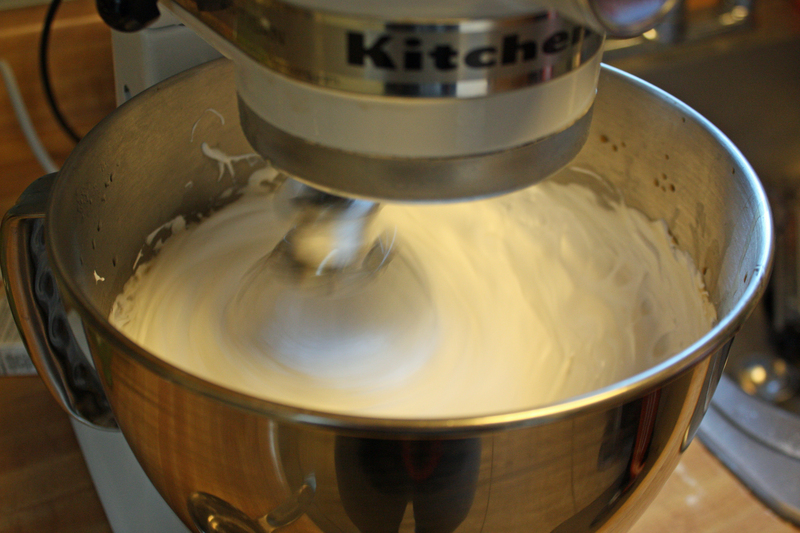 Place 1/2 cup (120 ml) cold water into the bowl of your electric mixer that is fitted with a whisk attachment. Sprinkle the gelatin over the water and let stand until gelatin softens, about 15 minutes. 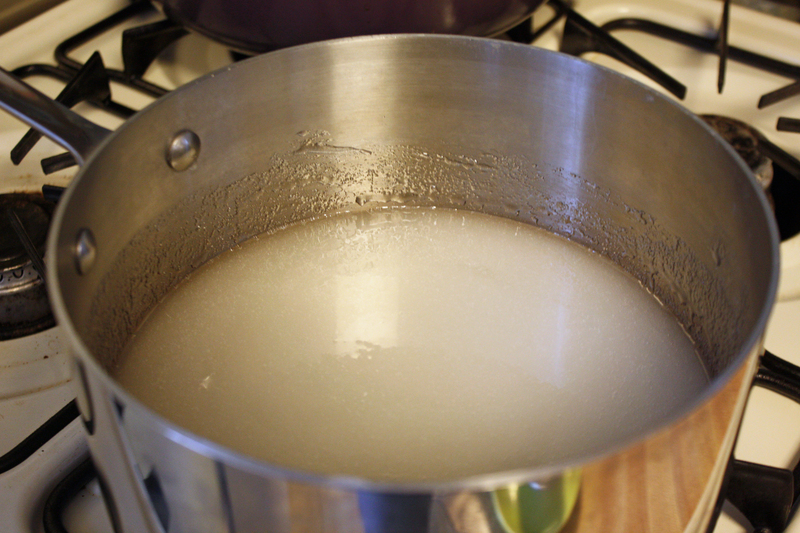 Meanwhile, in a heavy two quart saucepan, place the sugar, corn syrup, salt, and remaining 1/2 cup (120 ml) cold water. Stir over medium heat until sugar dissolves and the mixture comes to a boil. 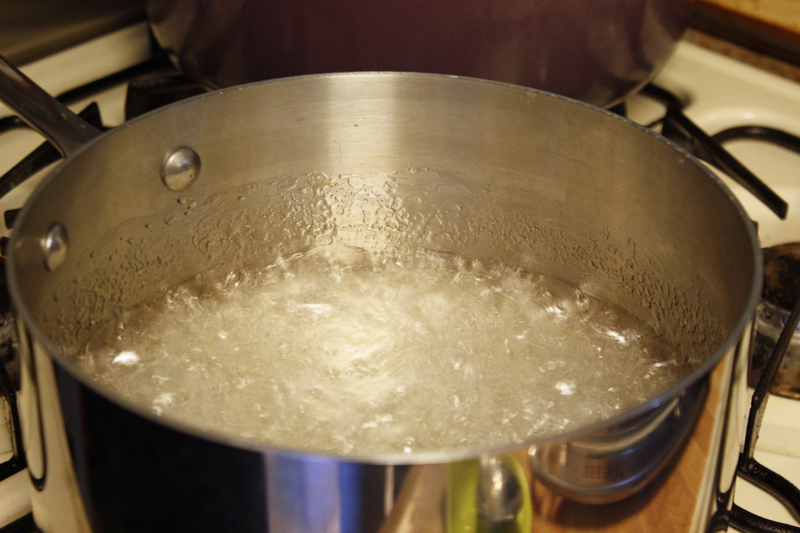 Cover the saucepan with a lid and let boil for about two minutes to allow any sugar crystals to dissolve from the sides of the saucepan. Remove the lid and attach a candy thermometer to the side of the pan. Increase heat to high and boil, without stirring, until the syrup reaches 240 degrees F (115 degrees C), about 10 minutes. Remove from heat. With mixer running at low speed, slowly pour the hot syrup into the gelatin mixture in a thin stream down the side of the bowl. 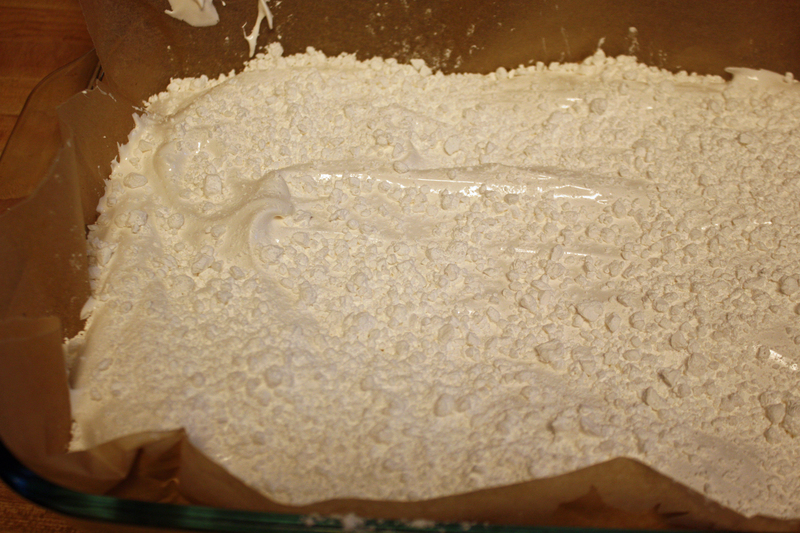 Gradually increase the speed to high and beat until mixture has tripled in volume and is very thick and stiff, about 10 minutes (looks like thick marshmallow cream). Add vanilla extract and beat to combine, about 30 seconds longer. 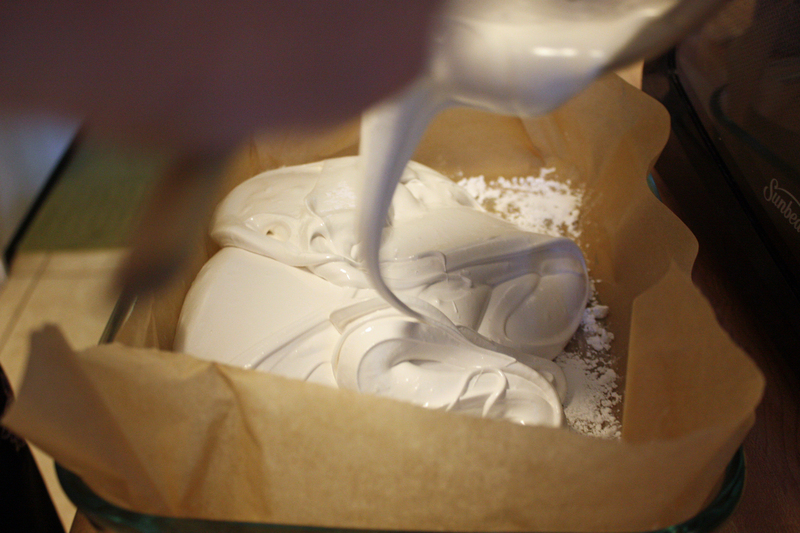 Scrape marshmallow mixture into the prepared pan and spread with a damp offset spatula or rubber spatula. The mixture is very sticky so just smooth it out as best as you can. Dust the top of the marshmallow with another 3 tablespoons of confectioners’ sugar and let stand, uncovered, at room temperature until set, about 12 hours. Remove the marshmallow from the pan by first running a small sharp knife around the edge of the marshmallow to loosen it from the pan. 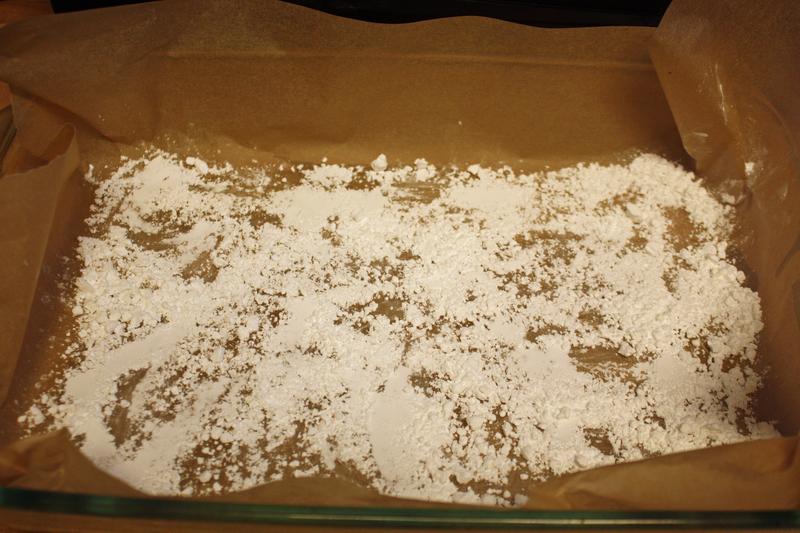 Invert the pan onto a large cutting board that has been dusted with confectioners’ sugar. You might have to use your fingers to help loosen the marshmallow from the pan. Peel off the parchment paper (the marshmallow will be sticky) and dust the top of the marshmallow with confectioners’ sugar. Cut the marshmallow into squares using clean kitchen scissors, a pizza roller or a sharp knife. 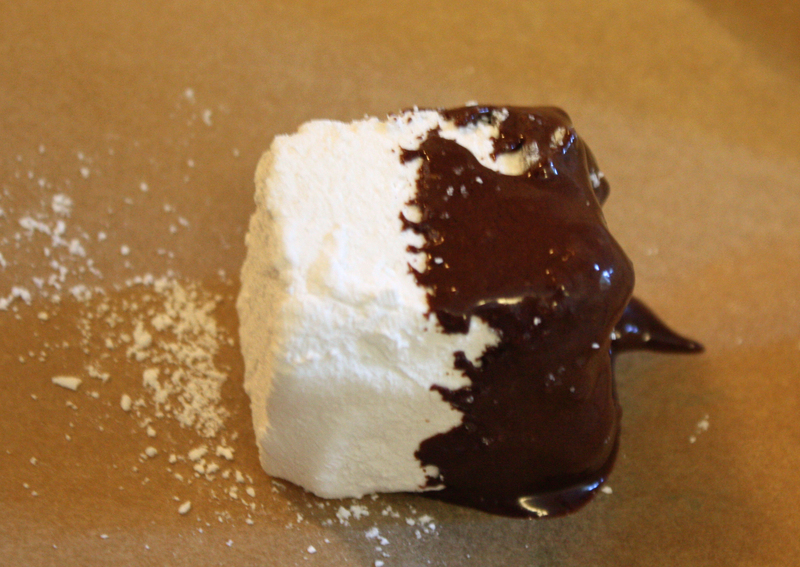 Dip the cut sides of the marshmallows in additional confectioners’ sugar. Shake off excess sugar and store the marshmallows in an airtight container, at room temperature, for up to two weeks. Peanut Butter Blossoms are another Christmas baking staple here at our household. 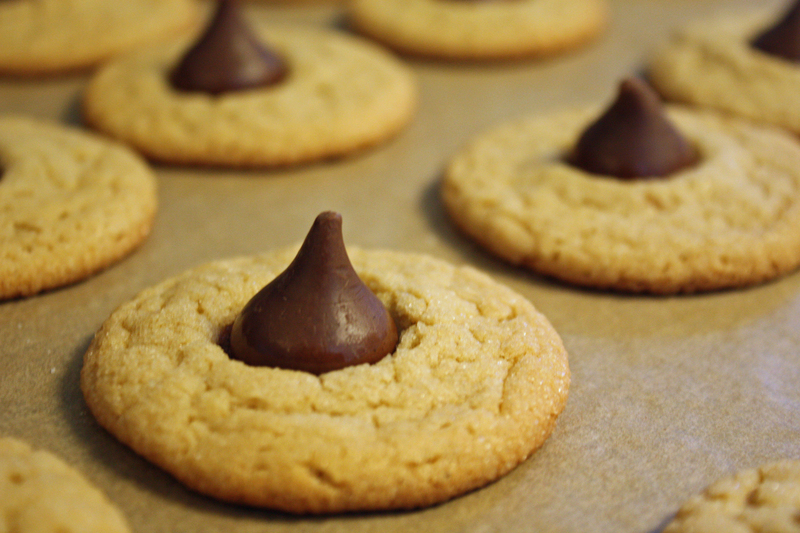 They’re easy and delicious–the hardest part is unwrapping all of those Hershey’s Kisses! Since I couldn’t remember what recipe we had used in the past, I decided to use the standard Betty Crocker cookie exchange version. Now, the recipe said it would make 7 dozen, but Jeff was convinced that there was no way it would come even close to that number, so we decided to make the recipe as stated. 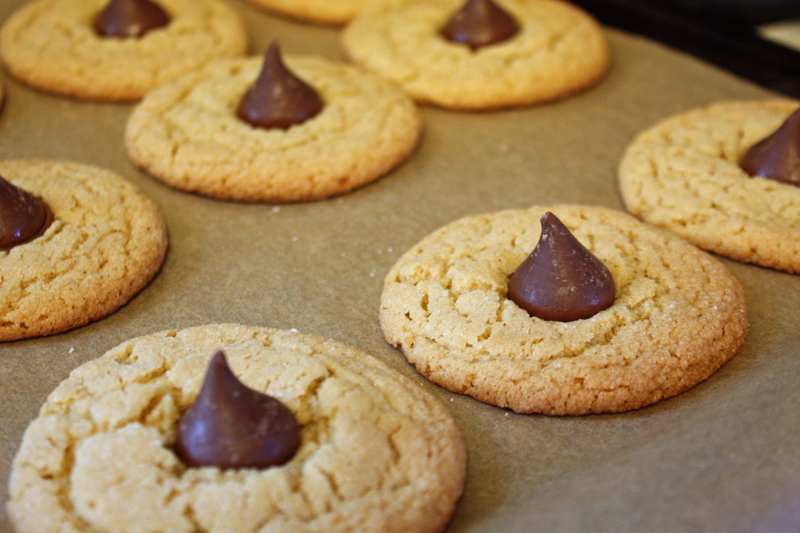 And, of course, the recipe really did make 7 dozen cookies…anyone want some peanut butter blossoms? For some reason, our peanut butter blossoms were really flat instead of nice and puffy like they normally are. As avid Trader Joe’s shoppers, we used the TJ’s creamy peanut butter instead of a traditional one and I’m wondering if this may have altered the texture or fat content of the cookies in some way. But, they still taste pretty darn good, so I’m happy! Heat oven to 375°F. In large bowl, beat 1/2 cup granulated sugar, the brown sugar, peanut butter, butter and eggs with electric mixer on medium speed, or mix with spoon. Stir in flour, baking soda and baking powder. Welcome to day 2 of Christmas baking week! This year, Jeff and I decided to add gingersnaps to the list. Normally gingerbread is not my holiday favorite, but as part of our amazing day at Sunset’s Savor the Central Coast, we were given a goodie bag with Safeway gingersnap crisps. 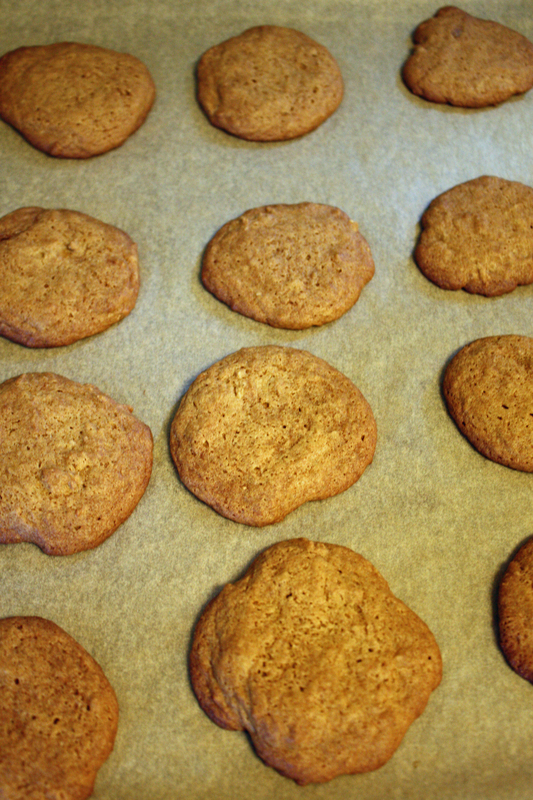 Random, I know, but I have been obsessed with gingerbread ever since–they were that good! So, like I often do on the blog when trying out new recipes, I turned to Alton Brown for a little advice. 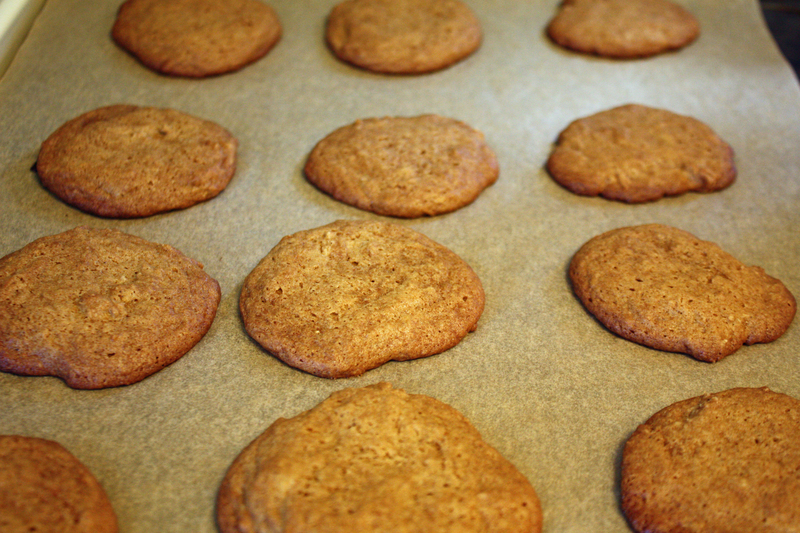 Being the excessive person he is, he used 3 types of ginger in his gingersnaps: fresh, ground, and candied. We were a little worried the candied ginger might be a bit gummy, so we decided to eliminate that ingredient and just use the other two. We used our microplane zester to grate the ginger which worked perfectly–I highly suggest getting one if you don’t already have one! He also uses ounces for his measurements which is a little annoying, but much more accurate. Overall, this recipe won the ridiculously easy and delicious award of the day! 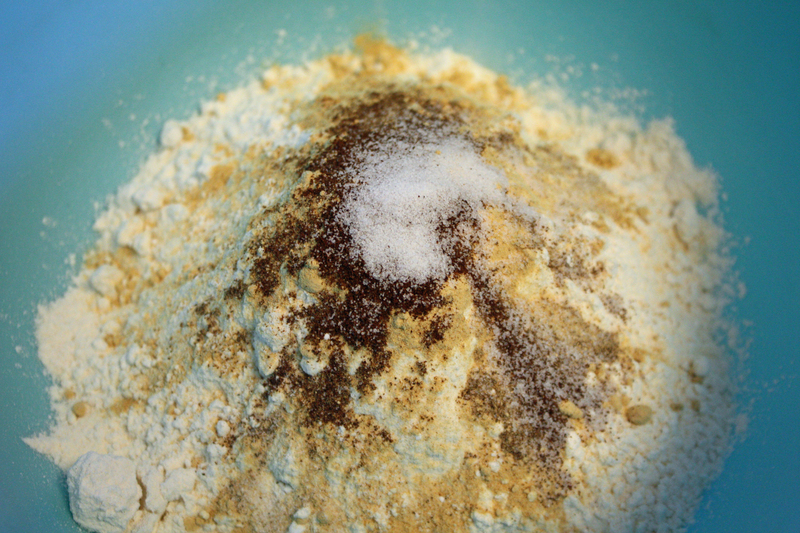 In a medium mixing bowl whisk together the flour, baking soda, ginger, cardamom, clove and salt. Place the brown sugar and butter into the bowl of a stand mixer fitted with the paddle attachment and beat on low speed until light and fluffy, 1 to 2 minutes. Add the molasses, egg and fresh ginger and beat on medium for 1 minute. 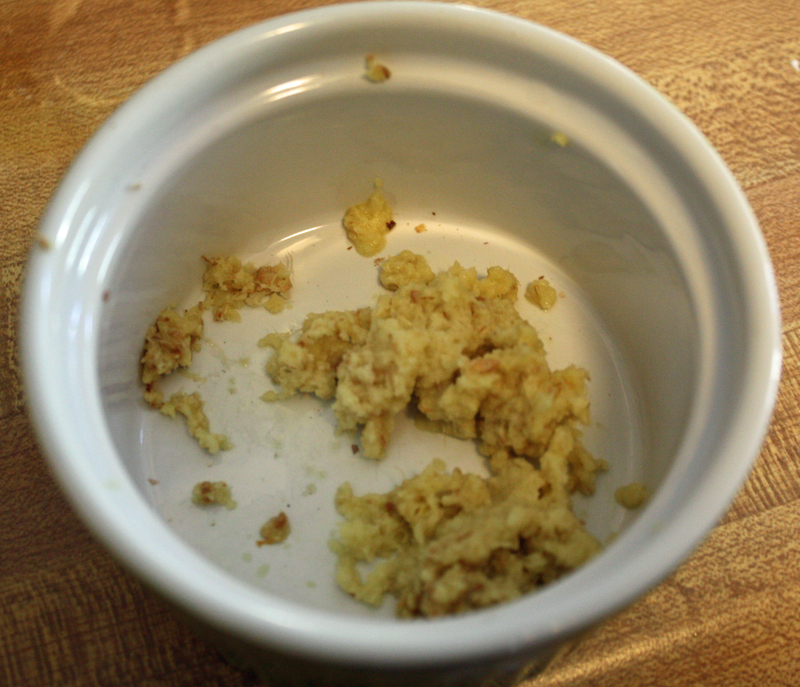 Add the crystallized ginger and using a rubber spatula, stir to combine. Add the dry ingredients to the wet and stir until well combined. With a 2-teaspoon sized scoop, drop the dough onto a parchment lined half sheet pan approximately 2-inches apart. Bake on the middle rack of the oven for 12 minutes for slightly chewy cookies or 15 minutes for more crisp cookies. Rotate the pan halfway through cooking. Remove from the oven and allow the cookies to stay on the sheet pan for 30 seconds before transferring to a wire rack to cool completely. Repeat with all of the dough. Store in an airtight container for up 10 days. If desired, you may scoop and freeze the cookie dough on a sheet pan and once frozen, place in a resealable bag to store. Bake directly from the freezer as above.